Night dive planning, organisation, procedures, techniques and potential problems. Entries, exits and underwater navigation at night. Nocturnal aquatic life, since many of the plants and animals you’ll see are different. 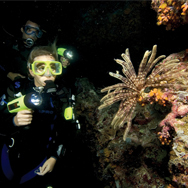 Be certified as a PADI Open Water Diver, Junior Open Water Diver or have a qualifying certification from another training organisation. Be at least 12 years old.